It's been thirty days since we dropped off our sweet dogs for their summer obedience camp in Colorado Springs, Colorado. My sweet Lin and I decided to take off a few days early to have a free day in Colorado and then train with our dog trainer for two days before heading back to Tulsa with our new improved pups!! It's a long 11 hour trip from TUL to Colorado Springs but you do end up gaining an hour with the time change. We checked into our downtown hotel and with the perfect 78 degrees outside it was time time to find a patio happy hour. 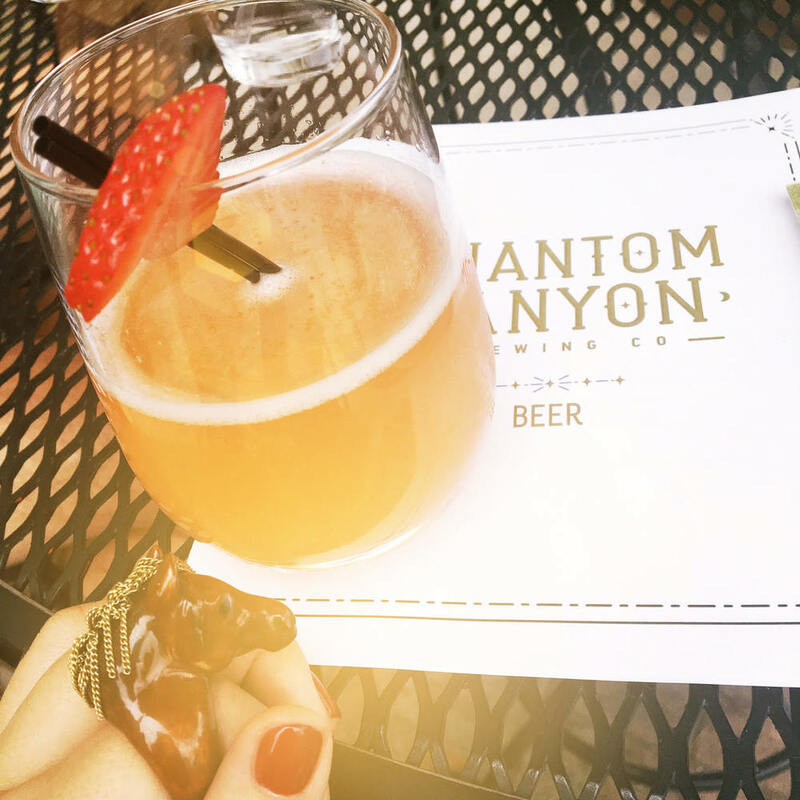 We ended up discovering Phantom Canyon Brewing Company. This 3-story brewery is housed in a historic building that features microbrews and a billiards hall with American fare. The patio is dog friendly and their happy hour is incredible. I loved the amber ale box car but then I had to indulge in a strawberry springs cocktail made with Colorado vodka. We met some locals and one thing led to another so we ended up dining there as well. The green chile pork soup was tasty. After dinner we strolled downtown a bit but since we had been up since 4 a.m CST, it was time to retire early. After a good night's sleep it was time for a full day of exploring the beautiful Colorado Springs. Love staying downtown too. 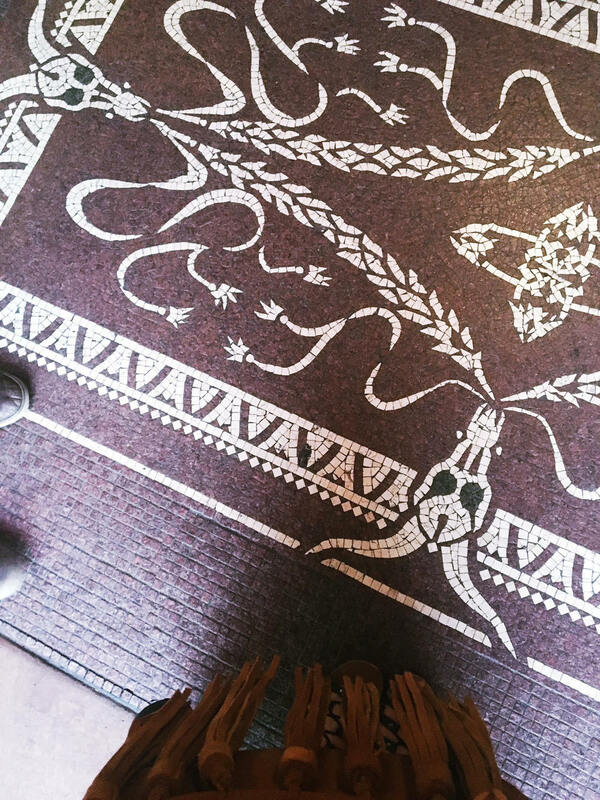 There is so much to experience on foot with plenty of options for breakfast or a cup of coffee. 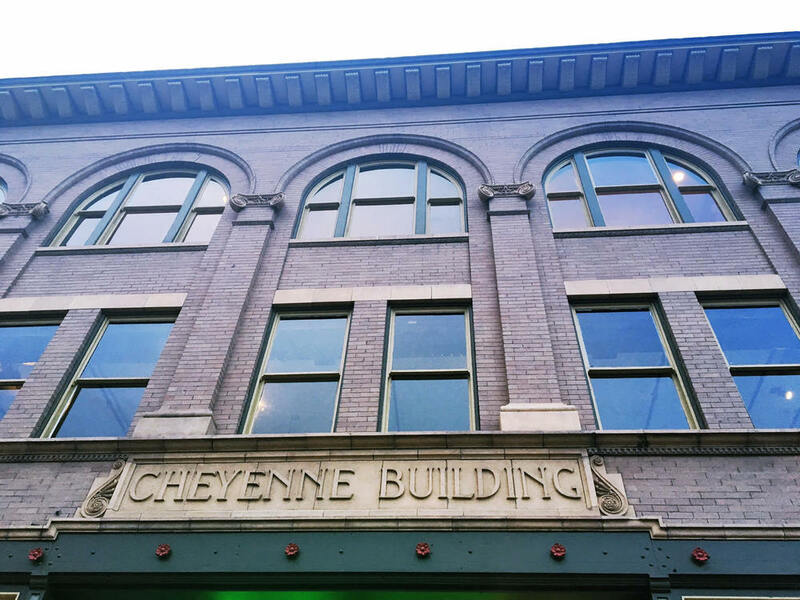 Tejon Street has some great window-shopping and latte sipping or you can check out the new Colorado Springs Public Market for organic produce from area growers, arts happenings and locally focused restaurants. 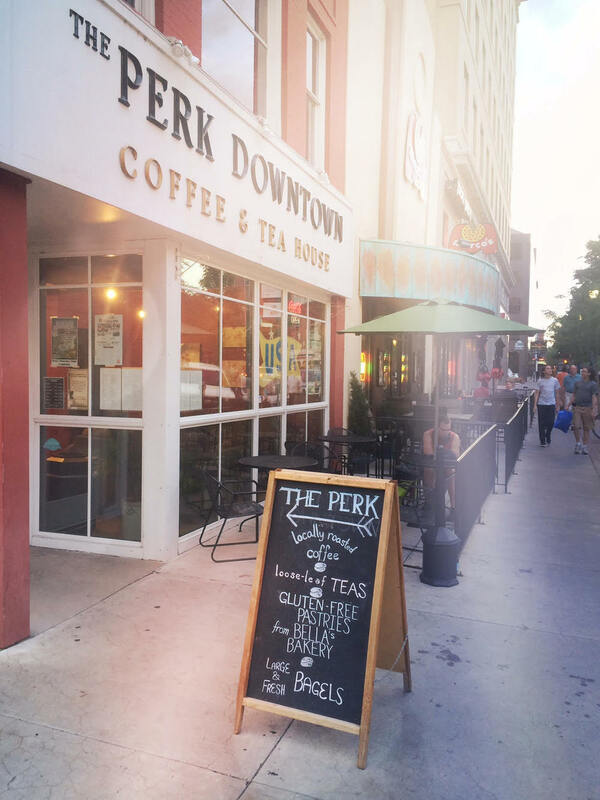 We walked over to The Perk for some morning jo and then grabbed the car and fueled up for the big trek up Pike's Peak. 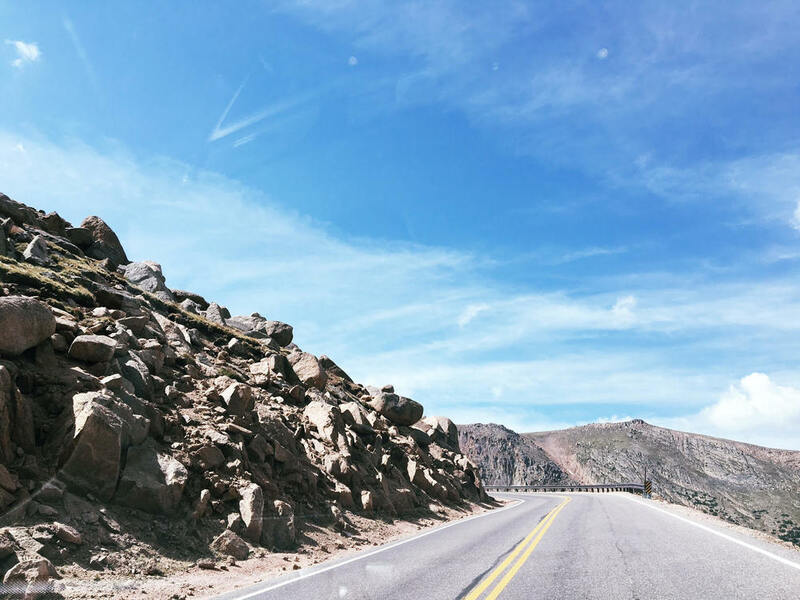 The 19-mile Pikes Peak Highway is a 2-lane road ascending more than 6,000 feat in elevation to 14,115 feet. And they require that you have at least a half tank of gas before you enter and even check your car breaks to make sure they are not over heating. 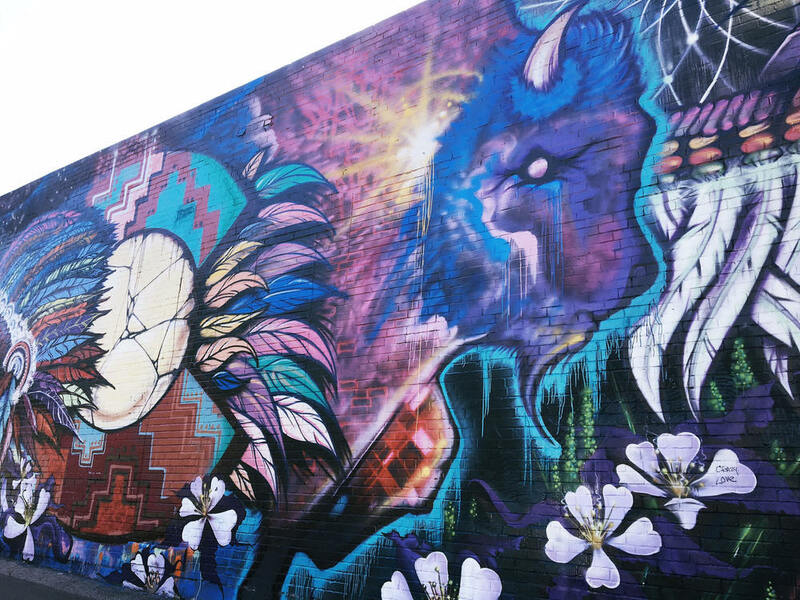 I love the fun murals all over the city! Colorado is so colorful and vibrant and alive! Pikes Peak is the highest summit of the southern Front Range of the Rocky Mountains of North America. 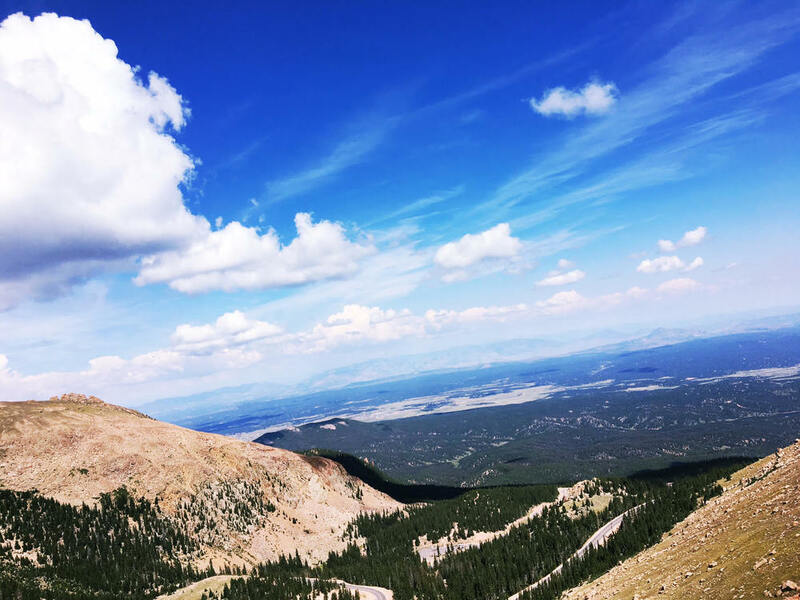 The ultra-prominent 14,115-foot (4,302.31 m) fourteener is located in Pike National Forest, 12.0 miles (19.3 km) west by south (bearing 263°) of downtown Colorado Springs in El Paso County, Colorado, United States. 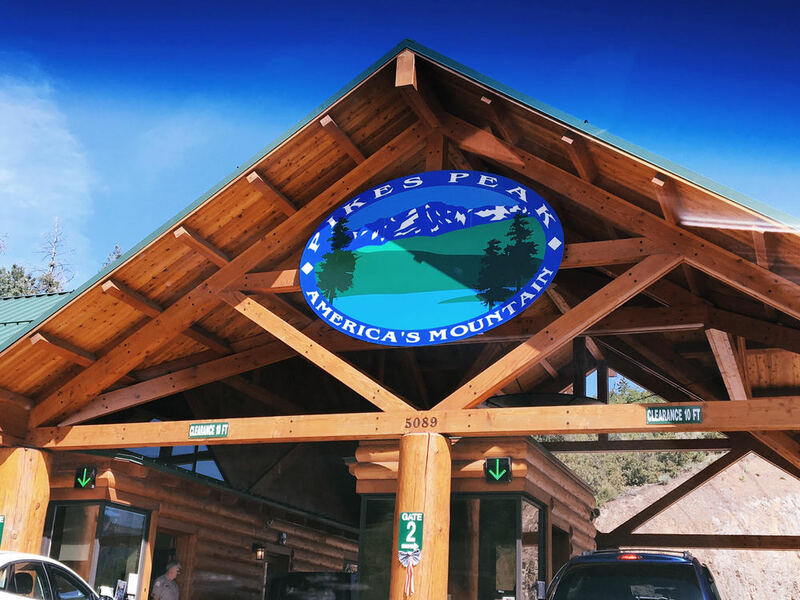 The mountain is named in honor of American explorer Zebulon Pike who was unable to reach the summit. The summit is higher than any point in the United States east of its longitude. And the marathons and bicycle races that take place here amaze me. That would be grueling. And with the elevation...whoa. I can't even. P.S. 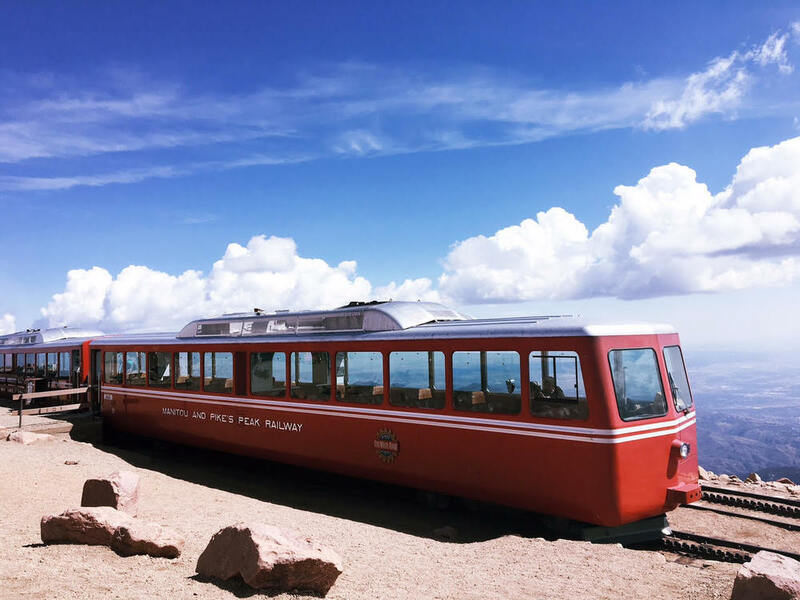 The summit can be reached via the Pikes Peak Highway by car, on foot via the strenuous Barr Trail, or — perhaps most uniquely — via the Pikes Peak Cog Railway, the highest cog railroad in the world. 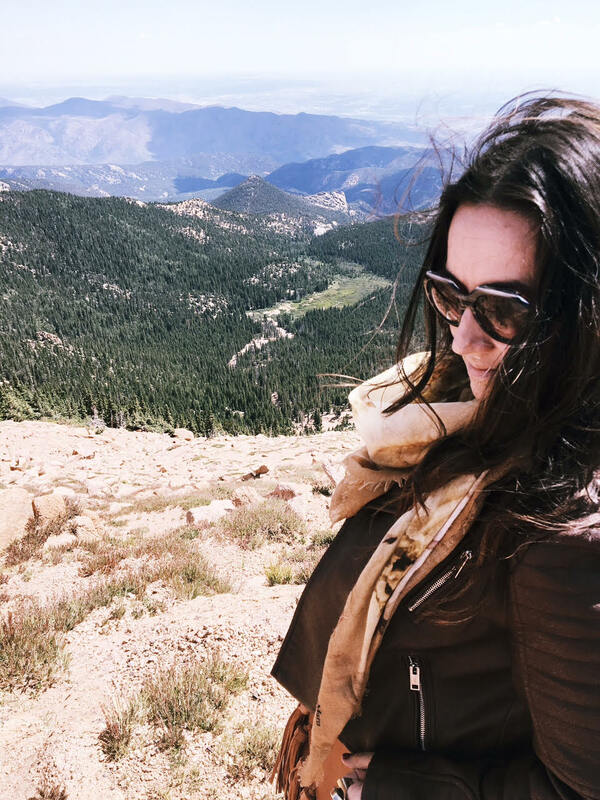 Via train, the trip takes about three hours, offering majestic views and possibly even a glimpse of the elusive Colorado bighorn sheep. 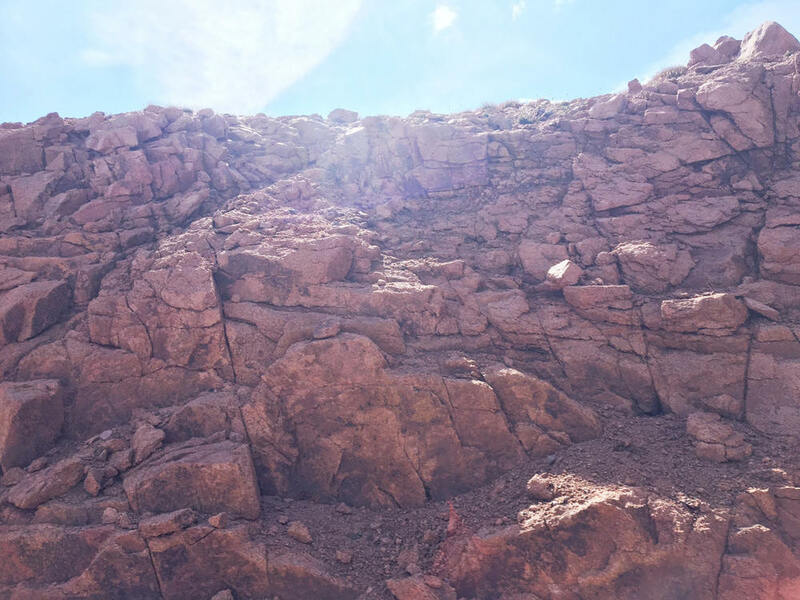 Explore in the peak’s shadow at the newly opened Southern Slope, with hiking and single track trails, fishing and bighorn-sheep viewing. 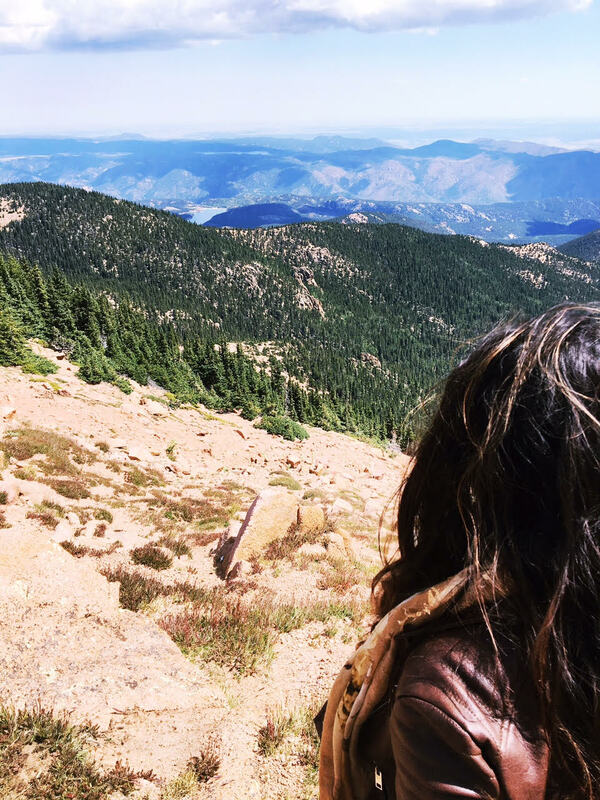 If you’re feeling extreme, traverse 2,000 feet in elevation in one mile on the Manitou Incline, one of the most challenging trails in the country. The views. The weather. The winding roads. Seriously one of the prettiest days of my life. And it was a brisk 53 degrees at the top. I am a huge fan of cooler temps so that was such a plus. Take your time and soak it all in. Only regret..not being on the BMW motorcycle. We head heard amazing things about Amanda's Fonda from a good friend and a lot of the locals and I am always on the hunt for good Mexican food. Fonda means "inn" or 'quaint house" in Spanish and I love the vibrant woody setting. Highly recommend the patio over looking the river. The wild berry margarita and steak tacos hit the spot. 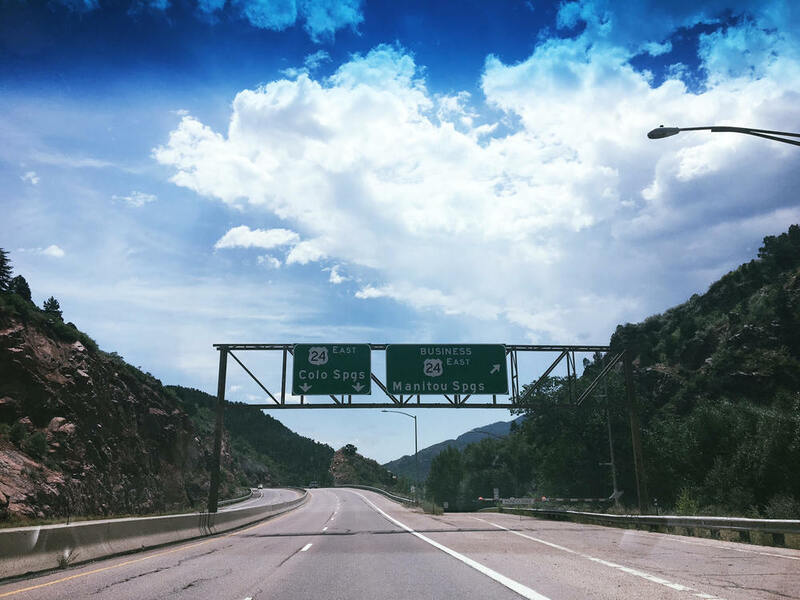 The drive to the Manitou Springs area was really beautiful too. 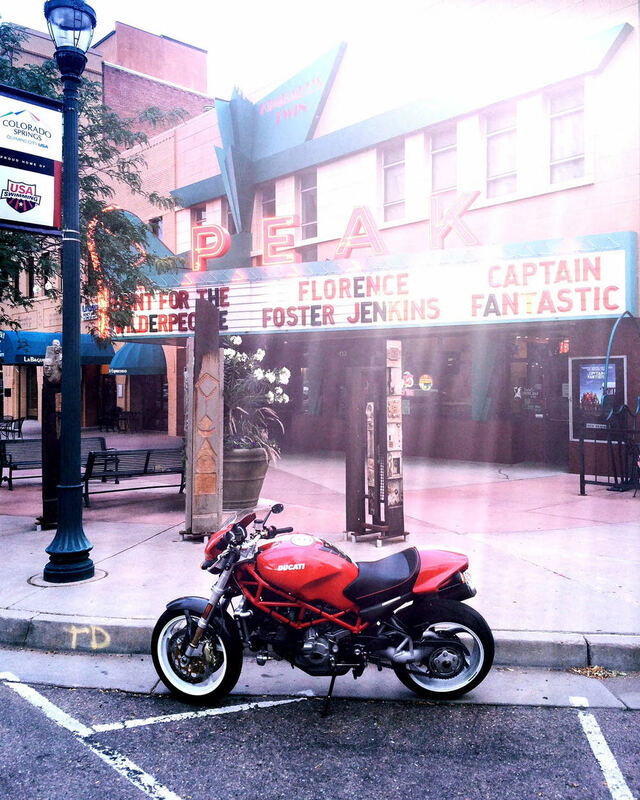 I would love to do some more exploring in Manitou Springs so I will need to add this to the bucket list. It was named one of the 10 Coolest Small Towns in the country by Budget Travel magazine after all. The city of Manitou Springs is a home rule municipality located in El Paso County, Colorado, United States. 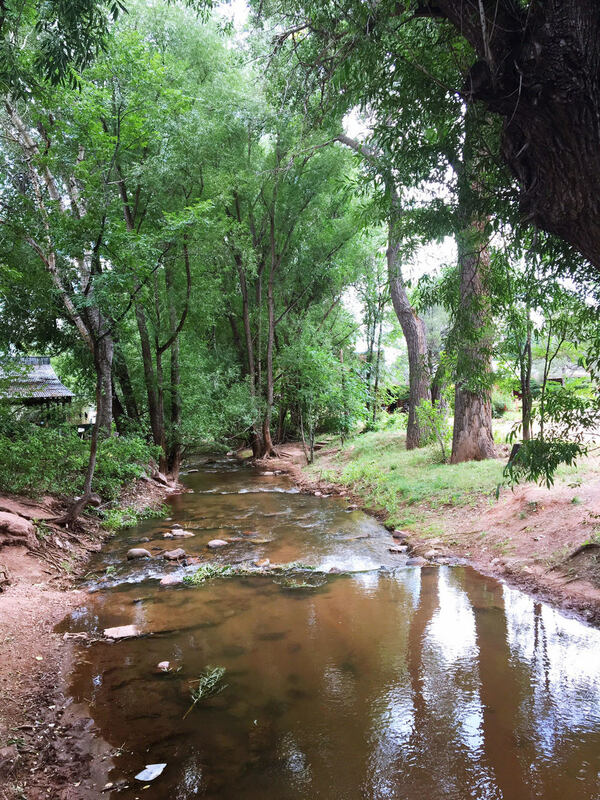 The town was founded for its scenic setting and natural mineral springs. 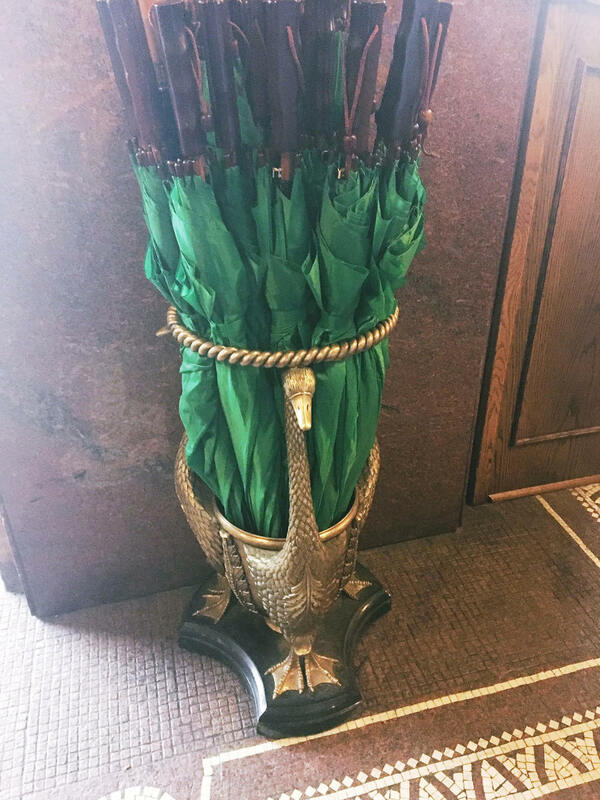 The downtown area continues to be of interest to travelers, particularly in the summer, as the downtown area consists of many one-story, adjoining, small shops, restaurants, and pubs, as well as a creek side city park with a children's playground made from unusual materials. 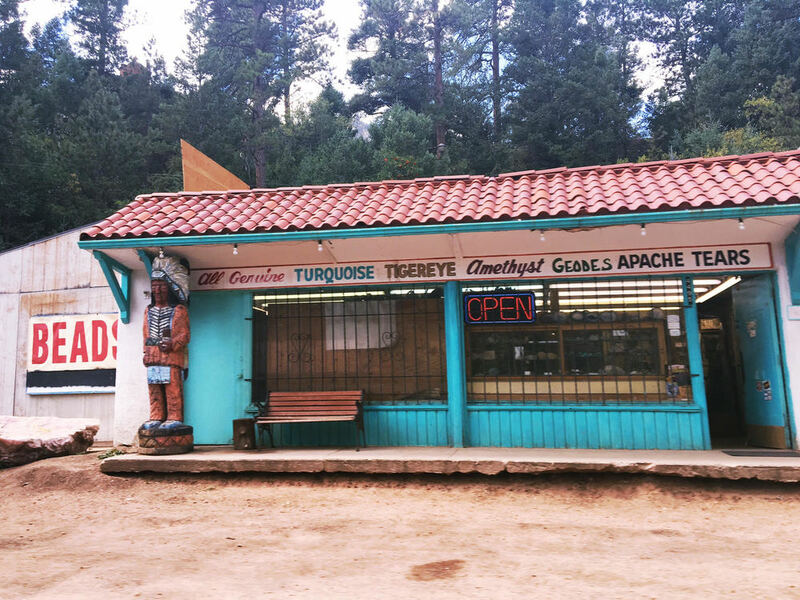 Among other services, shops cater to tourist interests such as clothing, candy, souvenirs, and outdoor recreation. The main road through the center of town was one of the direct paths to the base of Pikes Peak. Barr Trail, which winds its way up Pikes Peak, is easily accessible from town. The subdivision Crystal Hills was added to the municipality in the 1960s. There is so much to explore here. 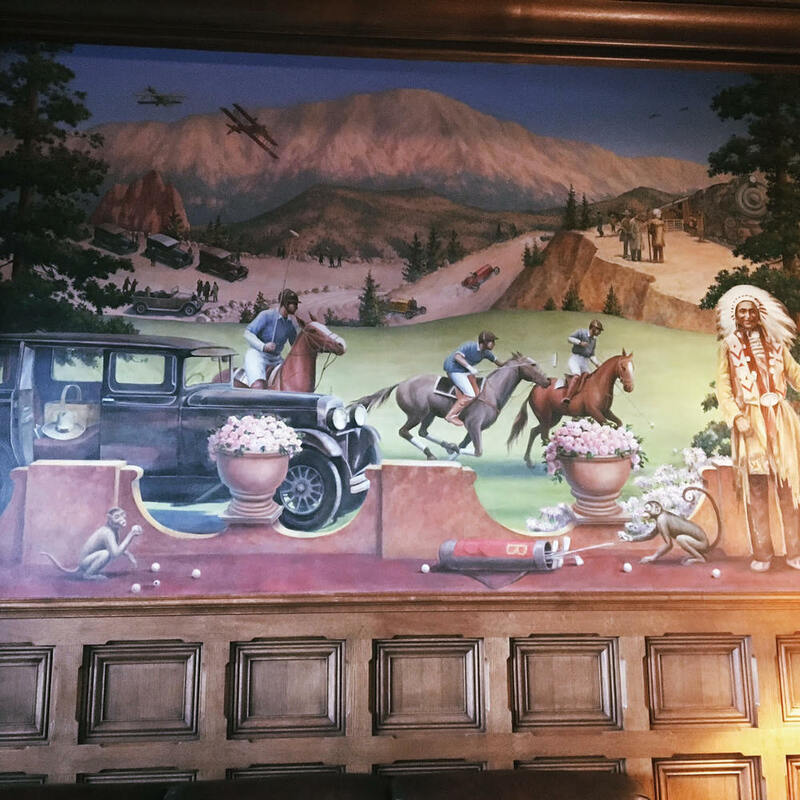 We are still ready for more exploring after lunch and we heard from some locals that we should take a nice quick 40 minute drive to Cripple Creek. 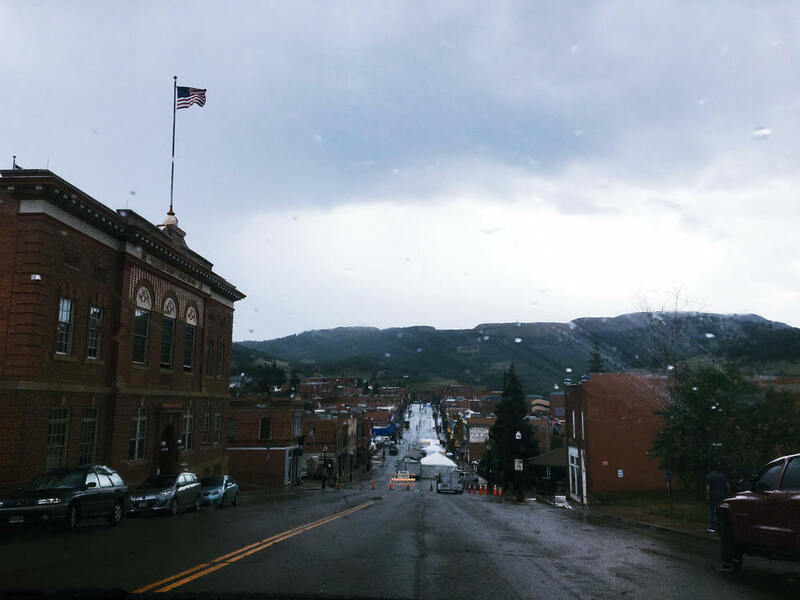 Located at the base of Pikes Peak, the historic mining town of Cripple Creek is surrounded by majestic mountains and breathtaking scenic views. The boom of Colorado’s Gold Rush put Cripple Creek on the map. 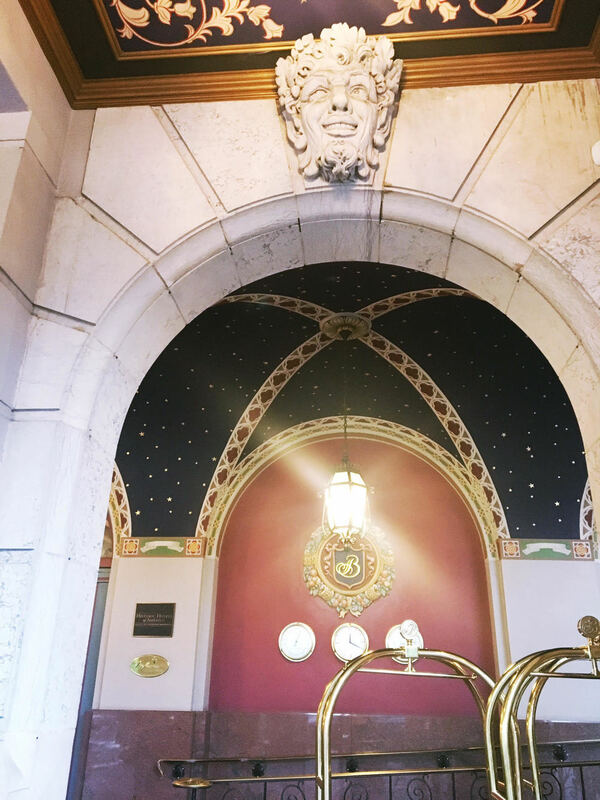 More than 100 years ago, this mining community attracted thousands of gold-seekers in search of their fortunes, and you can still do that there today in the town's casinos and gaming halls. Gambling is not really our thing but I love a good scenic drive and mountain town. It started pouring rain the second we arrived and it got really chilly and the main road was also blocked off to the public as they were setting up for a Veteran's Day event so poor planning on our part for sure. So much for that! But it looks adorable and fun and I would definitely go again. 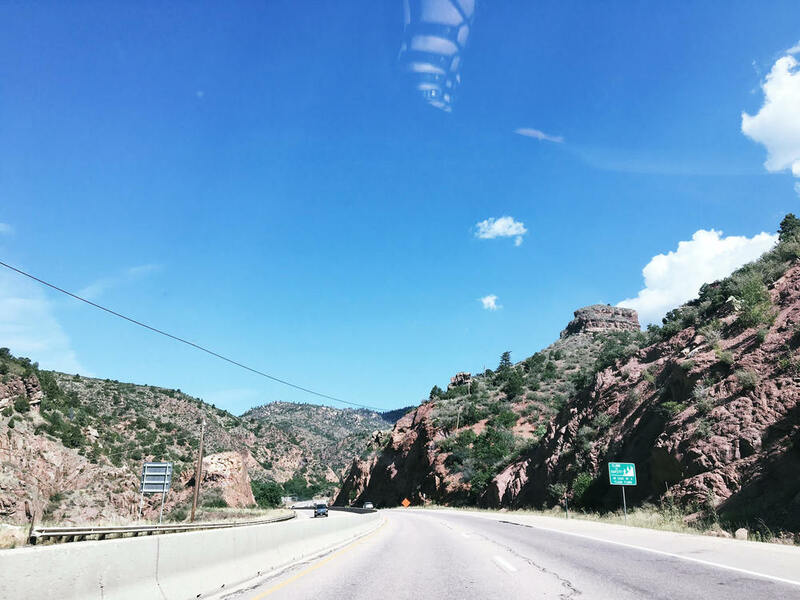 We went a direct direction back towards Colorado Springs to see new scenery and I am so glad we did. 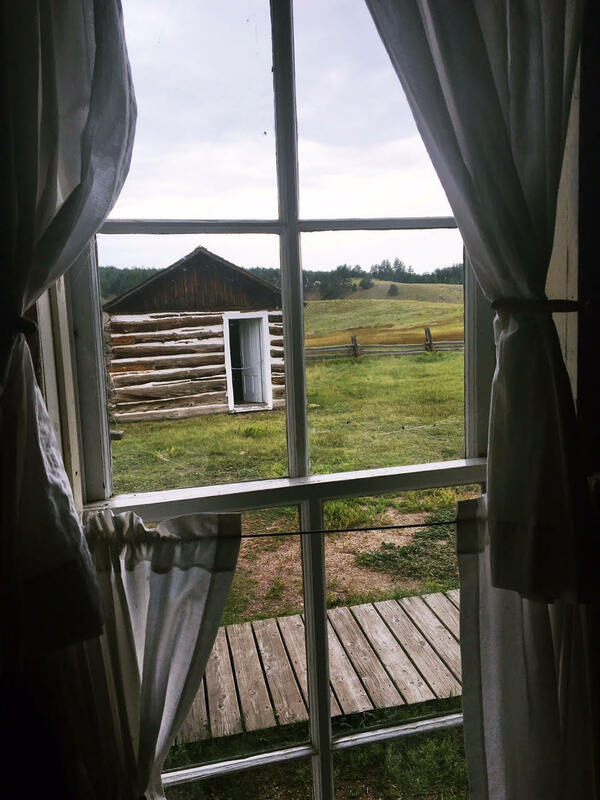 We stumbled upon Florissant, Colorado and the amazing Hornbek House, also known as the Adaline Hornbek Homestead. 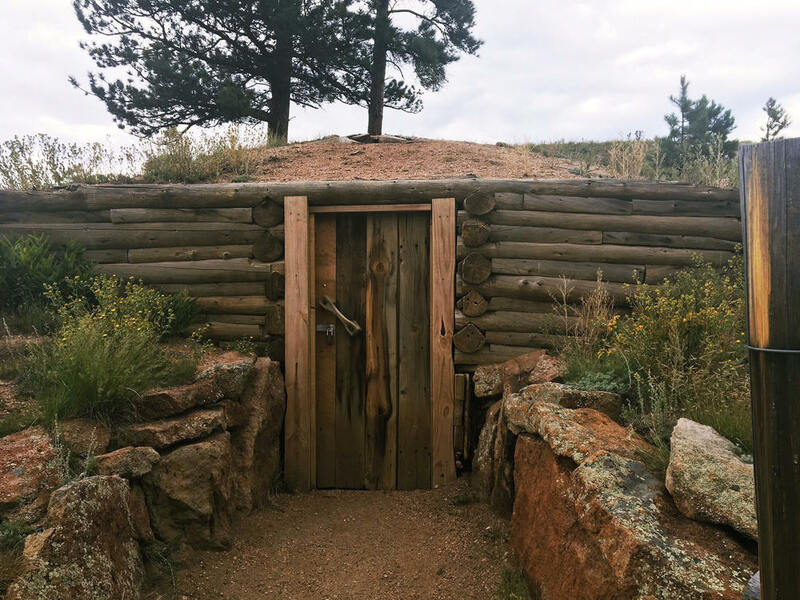 It was built in 1878 for Adaline Hornbek, who established a ranch in the area to the west of Pike's Peak in the 1870s. The log house is listed on the National Register of Historic Places as an example of an early homestead. 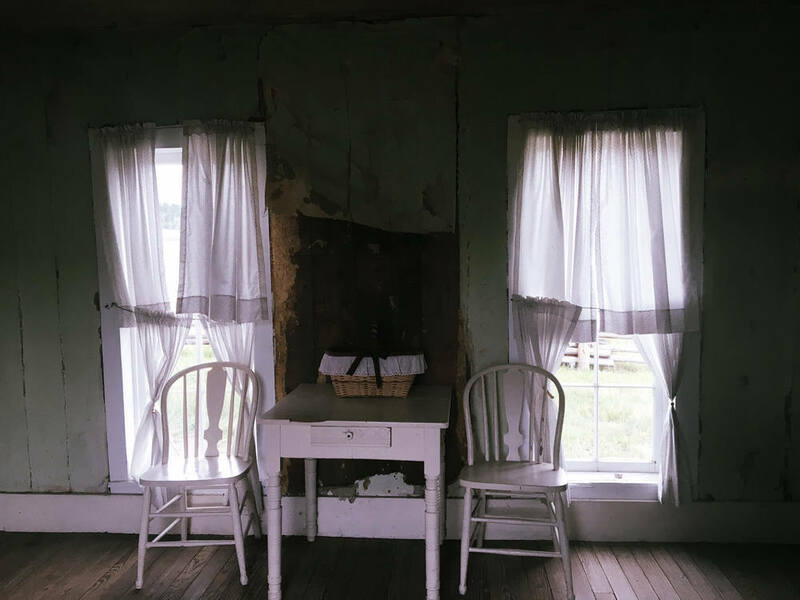 It is an excellent example of homestead-era log construction, with unusual Greek Revival window trim on one wing. The property includes a number of outbuildings which were relocated to the site. 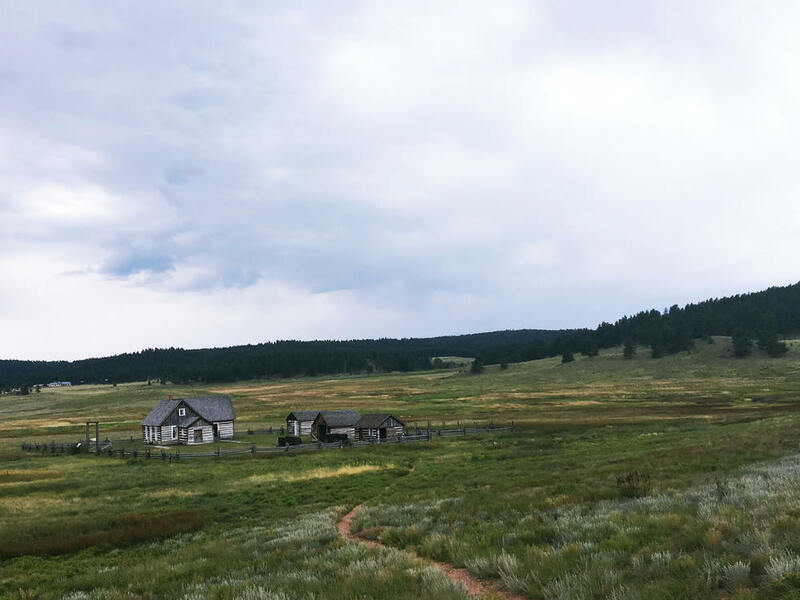 The property was sold to the National Park Service in 1973 and is included in Florissant Fossil Beds National Monument. Adaline has a very interesting story which you can read more about here. I found this space so intriguing. It's so interesting to see how life was so different then but they made it work without all the things we are all so accustom to today. 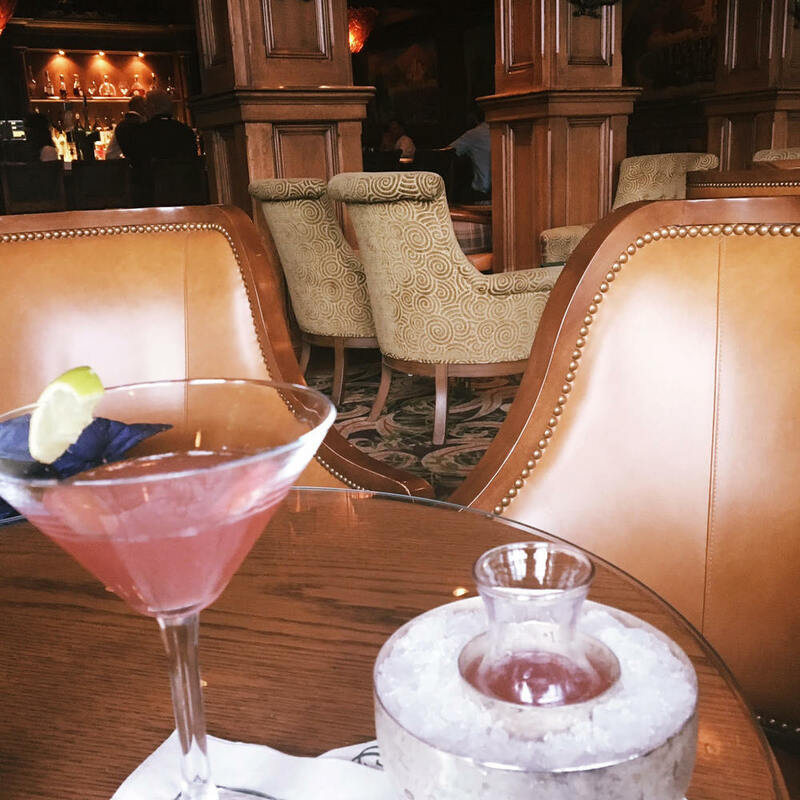 We end our explorations with a happy hour at the lovely magnificent Broadmoor. It's so luxe and I want to move in upon arrival. On the shores of man-made Cheyenne Lake, this luxury resort is 11 miles from the Colorado Springs Airport and 30.9 miles from Pikes Peak. Elegantly decorated rooms have flat-screen TVs and WiFi. Suites have unique layouts. 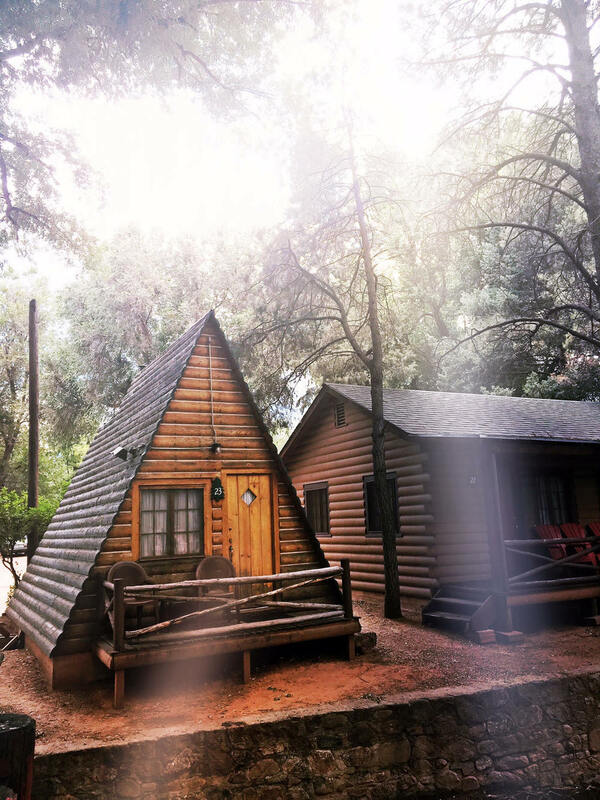 There are also cottages with full kitchens, 4-floor brownstones, ranch stays or fish-camp experiences. Amenities include several pools and an 18-hole golf course, plus a spa and tennis courts. There are also art and fitness classes, as well as rock-climbing and fly fishing (some fees apply). The resort also offers event space and 8 restaurants, plus clubhouse eateries. Drooling yet??! Yeah, me too. It's exquisite!! 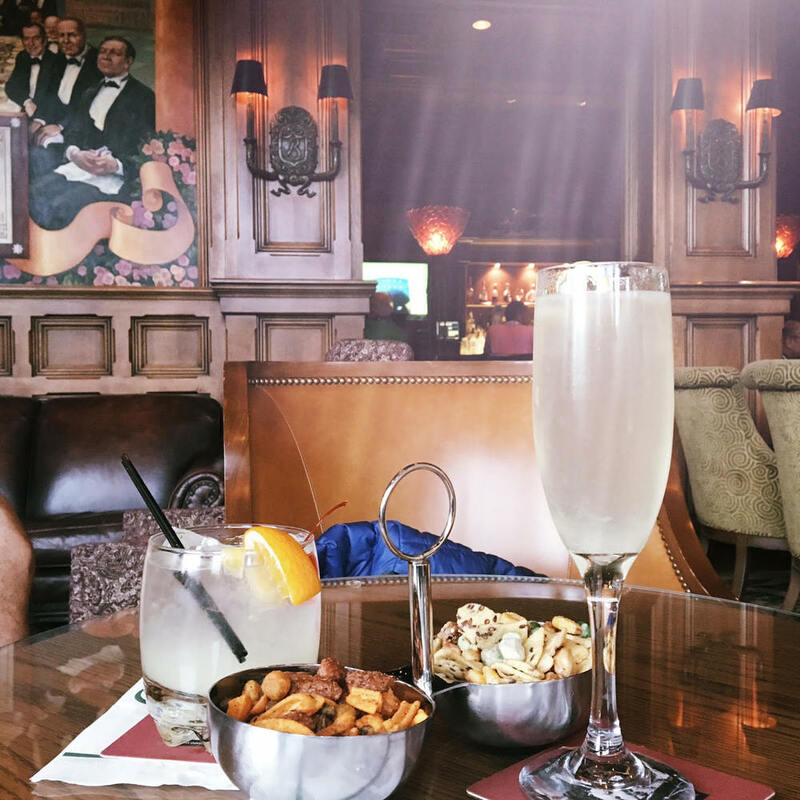 Highly recommend the French 75's and the Cosmo's! Not sure why I stopped drinking the cosmo but I am bringing it back! Lastly ice cream is a must at Josh & John's in downtown Colorado Springs. They make their own waffle cones and they are delicious. I had the Colorado Rocky Road!! What a fabulous day! And this was just Thursday. We did not depart until Sunday so there will be definitely be a part two. We have our dogs now after thirty days and we cannot wait to bring them home to Tulsa tomorrow. I cannot wait to share some amazing updates with you on their progress! !